It always amazes me how much variety you can find in match-3 games. Naturally, Bejeweled 2 is the gold standard, one of the truly dominant alpha apps out there. But there’s a whole range of other match-3 games out there of wildly varying quality, and Puzzlings is one the rare match-3 games that stands out from the pack a bit. It’s not notable for any particular game play reasons, but it’s one of the better offerings to also be completely free, which, sadly, isn’t to say that Puzzlings is without its flaws. You are a Puzzling, a cartoony little creature that lives in the country of Wardrobia, and it’s your job to restore color to the world by playing through a bunch of match-3 levels. No, the game doesn’t win major points for story. Successfully matching up 3 blocks helps fill a meter that eventually unlocks shattered tokens, which you have to reassemble on the game board to complete the level. Some of the odd quirks of the system is that you can rotate sections, move blocks multiple spaces along straight lines, and you’re not required to make a match with a move, which can make things a little too easy sometimes. 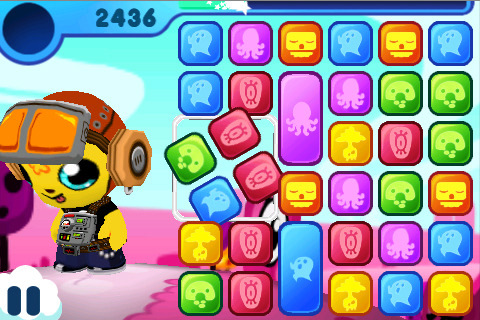 Additionally, later levels have an added complication of including long blocks that take up multiple spaces. I found the added features too complicated, especially when combined with a somewhat fussy interface. It was frustrating trying to use the rotate feature, and the long blocks made the game awkward to play. It’s definitely an added twist to a frequently tired genre, so if you’re looking for an added challenge in your match-3 games, it might come as a welcome change, but I didn’t care for it. There is also a prize feature for those of you who like collecting. You win different clothes or accessories to decorate your little Puzzling by completing levels, but there are also special levels and time bonuses for extra prizes. I likely would have found this more charming if the various prizes fit together better, but the designs frequently left my Puzzling looking like a mismatched freak. This was especially unfortunate given that the regular Puzzling design is so cute. Indeed, all of the graphics for the game are very bright and clean, so it was disappointing to have such a dissatisfying customization option. It’s not a Bejeweled-killer by any means, but maybe you’d prefer a match-3 game that’s easier to put down, when all is said and done. If that’s so, then Puzzlings is a reasonable, and extremely affordable, alternative. AppSafari review of Puzzlings was written by Tracy Yonemoto on April 1st, 2010 and categorized under Adventure, App Store, Free, Games, Puzzler. Page viewed 4091 times, 4 so far today. Need help on using these apps? Please read the Help Page.